These Come From Trees for Eco-minded Citizens! The original goal of this experiment was to create a way to politely, and subtly remind folks about accidental overconsumption. But one of the big parts of getting that message out to the world, was making sure that the message was built to spread by individuals. We like to call this a "guerrilla public service announcement." Why? Because it's a public service announcement that is spread by you. A single sticker, here and there, which then tips of the next eco-citizen to the project. That eco-citizen then gets his own set, and the cycle continues! And even though businesses and Universities and even K-12 schools are starting to get with the program, the main engine of this experiment is the individual who picks up 20, 50, 100, or even 200 stickers to put up in his own neck of the woods. That's how new people find out about the project: by you putting them up in your neighborhood! Around town: Put them up in the restrooms at your favorite coffee shops and restaurants. It will help save the owner hundreds of dollars a year, while reducing needless waste. Win-win! Airports, movie theaters, and other public places are great too! Anywhere with lots of people going through them is a great place make a difference by spreading the word. At work: TCFT work great at the office too, both in the bathroom and on the copier. If you're feeling really enterprising, maybe even email the facilities staff, showing them all the companies who are deploying TCFT stickers across their entire business. It only takes a single email in the right inbox to take TCFT stickers from a dozen around town, to thousands worldwide at a Fortune 500 company like Clorox. With your friends: Give stickers to your friends to put up in their town and office too. Online: Join our Facebook page and post pictures of your stickers in the wild on Flickr. Why does your participation matter? It spreads the word. We see it all the time, where someone purchases stickers in a given zip code that has never showed up in our inbox before, and then all of a sudden over the coming months, suddenly, that zip code shows up, more and more. That pioneering TCFT participant plants the seed, which spreads in his area. Join the movement, grab some stickers, and let's get going! The idea of "education" is a big piece of These Come From Trees. That is to say, at the end of the day, the individual stickers themselves are a quick, polite piece of instruction that help us all say "Oh, yeah, that's right. How much of these do I really need?" So it only makes sense that These Come From Trees stickers and schools would make a great team! A little more than a year ago, an enterprising student from Aragon High School up here in the Bay Area sent an email to us asking if we could provide him with complimentary stickers, as his school might not have the budget to buy stickers (and he, as a student, might not be able to navigate the ins and outs of purchasing via the school). We thought it was a great idea, and not only did we set him up, but we opened up the offer more broadly to any K-12 organization interested. We call it the These Come From Trees Education Challenge. Make sure that they get permission from their principal or facilities administrator. Submit your information using this web form to get the ball rolling! Since then, we've had hundreds of schools reach out to us to take advantage of this Challenge. With great success, with reports of up 30% reduction in paper towel usage! At the same time, there are some opportunities that can take a good idea, like These Come From Trees at your school, and make it better. I asked some of the teachers who had taken advantage of our Education Challenge what they did to make the experience even more educational, and these were some of the ideas that they came back with. Maybe you can take advantage at your own school? Document your deployment of TCFT Stickers: Take pictures of your class deploying them. Maybe even video. Put together a video of your class deploying the stickers and publish it to YouTube. We'll embed it in this blog! Or even create your own blog: Take the pictures you took, and publish them on your own blog. We'll link to you! What about making a lesson out of the stickers, even aside from the deployment? Conservation: Do a lesson around how "Reduce" can be as big a part of conservation as "Recycle." What else can be reduced even before we have a chance to recycle it? Math: Can you do experiments around how much paper the stickers are saving? Test before and after they go up. Do estimations of how many paper towels get used at your school, in your district, in your state. Do estimations of how many paper towels could be saved in your school, district, and state. How many trees is that? Business: Explain the idea of "return on investment" and how using some paper now (the sticker) can save more later. How long until the investment is paid back? How about for your whole school? The more detailed writeup is available below. Most of all, let us know what you did, by emailing us at thesecomefromtrees@gmail.com or by commenting on this post! 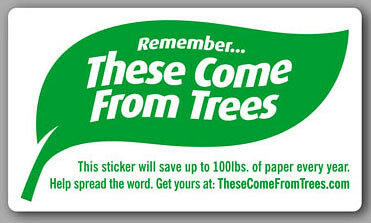 And when you're ready to put up These Come From Trees stickers at your school, let us know! These Come From Trees Lesson Plans petekazanjy Lesson plans for using These Come From Trees in a classroom.